﻿Energy Use In Australia Non-Renewable and Renewable Solutions to Australia?s Future Electrical Energy Needs Graph 1: Predicted population growth of Australia by the year 2050 (Larsen, 2010) With Australia?s population to likely double in size by 2050 and lifestyles to become further dependent on affordable energy, our electrical energy needs will no doubt increase. As current non-renewable sources diminish, we will have to turn to other sources-both renewable and non-renewable- if we are to secure Australia?s electrical energy future. This will require us to reduce our green house emissions and develop scientific solutions to solve this energy puzzle. 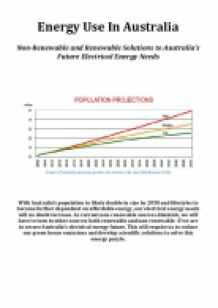 Energy Use In Australia As Australia?s population continues to rapidly increase and will most probably be around 42 million by the year 2050, the future of our accessibility to current electrical energy sources will be threatened. In the future, the demand for electrical energy is undoubtedly going to increase with the International Energy Agency predicting that global energy demand will grow by around 40% by 2035 (Australian Government, 2012). However, non-renewable resources for electrical energy will slowly diminish, affecting all aspects of our daily lives and many of our day-to-day activities. Electricity is fundamentally important to how Australians live today. Electricity runs almost every appliance in homes and businesses, it provides light and warmth and in many homes it also provides the power to cook and heat water- all of which rely on our current non-renewable sources of electricity. ...read more. (Lamb, 2012) Current Position of Australia?s Electrical Needs Currently in Australia, science is still attempting to solve the country?s energy issues and is attempting various solutions. Science has proven that non-renewable resources will soon diminish and new renewable resources will have to be sought out. Australians have attempted to solve this problem through the installation of solar panels and wind turbines to harness some of nature?s constant sources. There has been measured success as the energy created from these sources are not enough to power the entire nation and if it were to, millions more turbines and panels would be required to produce the equivalent of one single nuclear power plant(Carrington, 2013). However, in other parts of the world, science and nuclear power have already been able to solve the problem of energy. Countries like the USA have been using nuclear energy for years and have significantly cut down on emissions of greenhouse gases. In 1998, it was reported that there had been a 48% reduction of greenhouse gases emitted by electricity companies that used nuclear power plants. If Australia was to do the same as USA, then there would also be a significant reduction in the greenhouse gases emitted in Australia-just like the reduction in USA, thus theoretically solving the problem. (Nuclear Energy Institute, 2012) ...read more. The health and wellbeing of the Australia?s environment is something scientists are always trying to find ways to improve so that we can keep global warming at bay and also improve living conditions (i.e. air pollution levels) for everyone. If nuclear power is able to achieve this, whilst also fulfilling Australia?s energy needs then it will be quite successful. 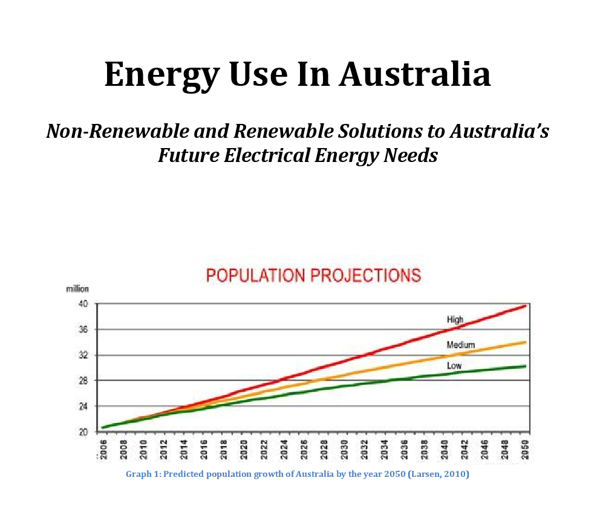 Conclusion As Australia?s population continues to rise at a rapid rate, the future of our accessibility to current electrical energy sources will be threatened as they continue to diminish. Currently, our electrical plan will not be sufficient for over 42 million people in the future and so a new solution must be sought out. Nuclear power is one possible solution as it can fulfill our goal of reducing greenhouse emissions, as well as producing adequate electricity to power Australia in the future and many more millions. Nuclear power is beneficial for Australia?s economy as it reduces the price of electricity for households and companies, whilst creating jobs to construct the power plants, mine the uranium (also a boost to the mining industry), and run the power plants. Nuclear power also has a positive effect on the environment as it only emits half the amount of greenhouse gases that coal emits and produces no controlled air pollutants. Nuclear power would be effective and successful in Australia as it would is beneficial for us in numerous ways and it would fulfill our energy needs for the future. ...read more. all effect the life cycle and natural beings, while they affect the structure of plants and all other organisms. These effects can be observed chemically, physically and biologically, and by the experiments which have been done by the group will determine whether or not global warming causes effects. it says that Noah planted a vineyard. Because of this, its use was spread throughout European (and Christian) countries during the first millennium of the Common Era (C.E) but the use of alcohol was mainly restricted to the wealthy people in society. people with this disability to step on the road with users of electric cars. Impact of the Issue: This issue impacts the society in a scientific and environmental way, as the development and use of electric cars can result in a more polluted atmosphere. can alter to my exact specifications, it has an easy to use interface so I can navigate and edit my website design easily and it is free. These aspects make Wix the perfect website designer for a novice like myself. liquid shellac, which is used as a brush-on colorant, food glaze and wood finish. However that as the World War Two began, shellac become a limited supply cause it was used mostly for the production of guns. As a result the coating changed to a nitrocellulose-based lacquer-type coating. Biuret test is known to determine the presence of protein by showing the purple color. The table shows that the test showed clear purple color of protein substance whereas other ones have a blueish color which is a control color.